Twenty-two letters from Robert Buchanan to William Hepworth Dixon (editor of The Athenæum) have been preserved in the collection of William Hepworth Dixon Papers in the Charles E. Young Research Library of UCLA in the United States. These are transcribed below and I would like to thank Molly Haigh for her help in acquiring copies. At the moment there are two other letters to Dixon on this site, both of which predate the ones from UCLA, so I thought it appropriate to add them here. From the National Library of Scotland. Letter to Hepworth Dixon . Circumstances, which I shall explain, have compelled me to leave Scotland and come to London, of whose labyrinths I am utterly ignorant, hunting the swift golden-horn’d stag Fortune. I came with exactly eighteenpence in my pocket, my sole resources—a miserable adventurer, whose only fortune was his great hope. My fate at present comprehends either work or salvation. I believe your former kindnesses have been noble and disinterested—God grant that your conduct may prove so still. I cannot mince the matter—I want help, not gratuitous, for I will work bone brain and sinew for any man who will employ in any way—as a writer or as a laborious proof-correcting drudge. I shall take the liberty of calling at your Office to-morrow (Wednesday) at 12. If you can do anything for me, I fully trust you will. A young man of nineteen, I have only myself to rely on, & in this great ocean of London must either sink or swim. For God’s sake, give me a chance of swimming. I have in contemplation a series of short sketches of a peculiar character, anent obscure Scotch poets whose songs are sung in every barn & byre, while the singers are ignorant whose songs they sing. If this carefully and powerfully done, it might prove valuable as well as interesting. The year, 1860, has been added to the letter in pencil, in another hand, but is correct. Buchanan left Glasgow for London in May 1860 and this letter was presumably written shortly after his arrival. From the Folger Shakespeare Library, Washington, D.C. Letter to William Hepworth Dixon . Hazlitt says that literary experience means simply the relation by individuals of the truths they have read or learnt before twenty. This is only partly true, but I would ask you to let its part-truth apply to my case. I am now twenty, getting on for twenty one, and in spite of the necessary inexperience you have once or twice mentioned, am—I think— able from my range of reading to deal with some provinces of English poetry. This may be egoism; but may I beg you, in your goodness, to test me? You see, I am doing all I can to elbow my way in the world, and I feel very miserable when you tell me my youth is an obstacle to my eating bread and butter—or, which is the same thing, getting it.—Wont you give me one trial with a tolerably good book of poems, and show me an opportunity of uttering part of the little I know, in your columns? Macaulay had an article in the Edinburgh Review when he was twenty; and I myself am doing responsible work for responsible journals.—I wish you would try me with Miss Procter’s forthcoming volume of lyrics. I liked her former book much. I will thank you, here, for your candour. You did not attempt to deceive me by the cruel falsehood about “no vacancy.” You said to me—“You are young, consequently inexperienced. I do not like to place very responsible work in your hands.” This was true kindness, I think. But do you in your heart believe that judgement is simply the result of continual contact with the materials for judgement; that the man who criticises poetry can criticise it without being in some respects a born poet? Poetry differs materially from science, exactly so called; it is the recognition of the significance of things visible by the aid of the imagination, the colouring and beautifying of things visible by aid of the fancy. Could not John Keats at twenty (in his letters) criticise poetry better than Gifford at fifty? Could not Shelley at twenty write truer things of poetry than the Edinburgh Reviewer who slaughtered “Christabel” or the burly Doctor who thought Shakspere an irregular spasmodist:—But I bore you. Take my excuses for troubling you, and do give me a trial. I have thoughts to utter, my own thoughts—give me a chance of uttering them, and do not measure my experience by that of the generality of individuals. Large experience is often condensed into a short life, by hard blows & incessant moral responsibility.—If ought but strict justice & pure truth should appear in what I write, never trust me again. Letters from the William Hepworth Dixon Papers (Collection 762). Library Special Collections, Charles E. Young Research Library, UCLA. Letter 1: 30th June 1863. Many thanks. The chief use that will be served by the appearance of a few extracts in the Athenaeum will be to give readers an idea of the style of the proposed book. The nom de plume has been suggested for several reasons: chiefly because it may screen me from those people who know me as a mere contributor to magazines. In writing for bread, two things have troubled me: a necessity of humbling myself to a very popular level, and a restless sense of wearing unnatural harness. It is down Chertsey-wards, or among the Scottish hills, that I breathe freely & write—as in “Undertones”—with an intelligible aspiration. I was going to publish quite anonymously, but my publisher recommended a pseudonym. Nothing so strongly convinces me that I was born to do something noble than the persistent manner in which the love of poetry has clung to me thro’ circumstances which, in ninety nine cases out of a hundred, destroy the afflatus. My pure feeling of ambition & fiercer & stronger now than ever it was. But you can guess my feelings. You too have struggled & suffered; and it is that fact that makes me think of you most tenderly—even when I think that you doubt the strength of my impulse upward. Well, the love of poetry & the personal struggle have dwelt apart so long; let them dwell apart for a little time longer. Another very strong reason for taking a pseudonym is the fact that my father is well known in some quarters as a writer on political & Church topics, & a thorough Radical; and that I sympathise with none of the views of himself or of his party. Originally Letter No. 2 in the collection. A word is crossed out before ‘give readers’. A correction before ‘among the Scottish hills’, is most likely ‘or’ but could be ‘&’. ‘My pure feeling of ambition & fiercer’ - ‘&’ is presumably a mistake and should read ‘is’. Buchanan had been using ‘Williams Buchanan’ since 1861, including for his two collaborations with Charles Gibbon in 1862, The Rathboys and Stormbeaten: or Christmas Eve at the “Old Anchor” Inn, hence the ‘W. Buchanan’ signature. As well as his father, there were three other ‘Robert Buchanans’ in Scotland, writing and publishing in various fields, so Buchanan’s dropping of the ‘Robert’ at this point in his career is understandable. This wouldn’t, of course, constitute a pseudonym, so we can only speculate on which name he wanted to use for Undertones. ‘Newton Neville’ was a pseudonym which Buchanan had been using since 1859 when he was editor, for a short time, of The West of Scotland Magazine. The name crops up in The Welcome Guest in March, 1861 and The St. James’s Magazine in August and October, 1863, and then fairly regularly in the latter until March, 1866. However, in the issue of The Athenæum of 11th July, 1863, a poem entitled ‘Marc Antony’ by ‘Adam Caverswall’ was published. ‘Caverswall’ is the name of the small village in Staffordshire where Robert Buchanan was born, and the poem was included in Undertones under the title, ‘Antony in Arms’. Given that in the following letter Buchanan describes his proposed pseudonym as a ‘fancy-name’, it is more than likely that ‘Adam Caverswall’ was what he had in mind. Letter 2: 13th July 1863. The objection you took to the fancy-name caused me more bother then you may think. I knew your great experience both of men & books, and I did not like you to think that I lacked moral pluck. So I have thought long & earnestly over the matter, and (without seeking other advice) have come to the conclusion that you are right & that I am wrong. I have no right to be ashamed of my name, and I have no right to look with contempt on my struggle here. A brave front will best display the spirit in which I am determined to meet all foes. Letter 3: 14th July 1863. Thanks for your offer to announce Undertones. It will be better however not to do so for about a month. Any interest that the announcement might awaken would get flat between this date & September. I am glad to hear that you are hopeful of the book It has at least been conceived & written in no mean spirit & I have hopes that it may even do good. To guide you in your announcement I affix a portion of the title page and contents. Voices of the Soul to Her Ideal. A Poem Composed of Poems. With an Apologue & an Epilogue. Ocean. It is the unpastured sea, hungering for calm. One or Two Short pieces from the Athenaeum. Letter No. 4 in the collection. Full stop missing after ‘hopeful of the book’, which ends first page. Letter 4: 13th August 1863. I think your kindly promised announcement would be most apropos if inserted in your issue for the first week in September – Saturday; Oct: 6., I think. Shortly after that date we shall begin to advertise. Might I suggest that, in the same number, you would insert one of the other poems—“Cytherea,” for instance? Of the Soul to the Ideal. With a Prologue & an Epilogue. I should perhaps explain to you that the Volume now to be published is called Part First because it deals only with ancient aspirations. In Part Second, I reduce my theme to its modern meaning & give a contemporaneous interpretation of the whole poem. Letter No. 5 in the collection. The new version of the title page of Undertones is written on the page adjacent to the second page of the letter, with a connecting line, rather than inserted directly in the text. Letter 5: 21st August 1863. I do think that the sub-title is wanting in simplicity, and that it will be better to drop it altogether. I was only afraid lest my volume should be mistaken for a collection of detached pieces, not of pieces harmonising (as I hope) into an intelligible whole. – You may guess that the title of my book has cost me more absolute trouble than the contents in their entirety. – “Part First”, I will also drop; though there will certainly be a Part Second—of Modern Undertones. The piece called “Venus” stands “Venus Cytherea” in my draft; hence my mistake in putting Cytherea alone in my last letter. As it is much liked by some people whose judgement I respect, I should like it used contemporaneously with the announcement. “Cyclops” & “Penelope” – as sent to you – are fragments of longer poems. Letter No. 6 in the collection. A word is crossed out after ‘I was only afraid’. Letter 6: 8th December 1863. Besides the usual copy for review, which my publisher has I believe forwarded, I shall gratify myself by sending you a private copy of Undertones—which I hope you will read lovingly for my sake. I expect nothing but fair treatment, however severe, at the hands of your critics, but I’m sure, if the review be favorable, you will aid me by giving it insertion as early as possible. I trust you have enjoyed your travels in other lands. What stores of reflection the sight of Syria must have awakened in a man like you! Letter No. 7 in the collection. The word ‘you’ll’ is crossed out before ‘if the review’. Letter 7: 31st August 1864. I leave for Norway next week, and shall take Copenhagen on the way—to be there during the Princes Visit. Would it be any good to send you a picturesque gossip on the subject—spiced with such salt as a knowledge of the language can give? You will be glad to hear that I have got a handsome sum for my “Idyls of Inverglen” (a very handsome sum for poetry) and that the book is confidently expected to be no ordinary hit. Letter No. 8 in the collection. 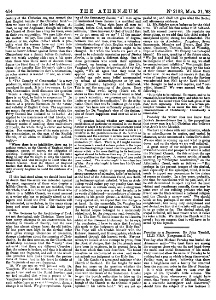 Buchanan visited Scandinavia with his father in 1864, ostensibly to report on the Second Schleswig-Holstein War (which lasted from February to October 1864) for the Morning Star. This letter fixes the date of the start of their journey to the week commencing 5th September. Letter 8: 17th October 1864. I have not quite finished the ‘Ballads’ paper—thinking it unfair to all concerned to do it too hurriedly, and being much pushed for time thro’ the Play. You did not name any specific time when you would like to insert it—so I concluded there was no hurry for a week. I hope I was not wrong? I shall send the paper to the Office on Saturday, & at the same time forward the books to your House. I have ordered Björnson’s last book, but it has to come all the way from Copenhagen. I expect it next week. Letter No. 9 in the collection. ‘I suppose’ crossed out and ‘You did’ written above, before ‘not name’. The ‘Ballads’ paper is presumably the review of The Ballad-Book by William Allingham, which was published in The Athenæum of 21st January, 1865. 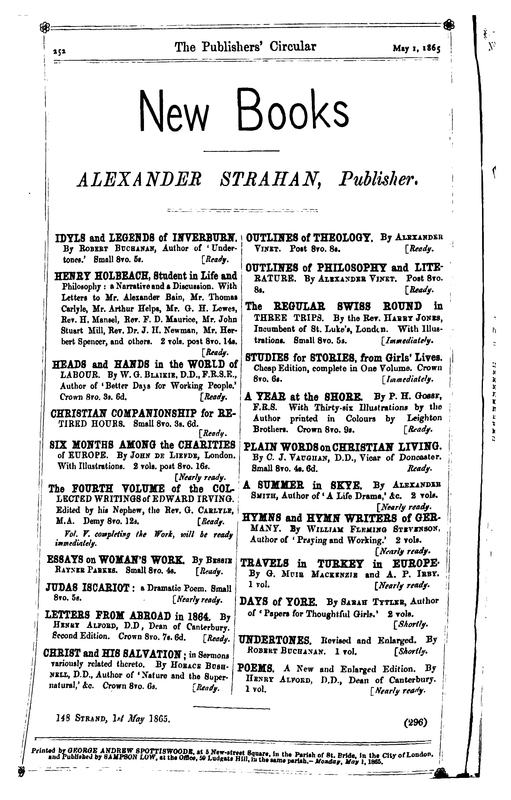 Information regarding contributions by Buchanan and others to The Athenæum is taken from The Athenaeum Index of Reviews and Reviewers: 1830- 1870. Letter 9: 14th February 1865. I was most unfortunately compelled to hurry home yesterday without seeing your Printer. The cold struck my feet, & put me to such agony that I didn’t know what to do. But I have written for the M.S. & will cut it down at once to 5 cols. I forgot yesterday to tell you that the first of my Idyls (Willie Baird) will appear in the next Cornhill—a second in the number after—and the whole book will I believe be published by April at latest. I stake much on this work, for it has in it I believe the elements of popularity. Lewes believes in it most ardently, & his opinion is worth much; I look for yours. I have not forgotten that, five years ago, when I wrote to you from Glasgow, you gave me encouragement—then when, God knows, I needed encouragement much. Very shortly I shall with your permission publicly allude to that fact—one not to be forgotten by me; the doing so will involve the communication of a secret—to be known only by yourself & Lewes. The secret consists only of the authorship of a certain Poem. All this I meant to say verbally but I was too hurried. Letter No. 10 in the collection. Letter 10: 20th February . I send you a line or two for the Gossip, in reply to Allingham, whose letter by the way is only a confession of guilt. – I see your last No. contains a Notice of the Book you requested should be sent to me—“Evenings in Arcadia.” There is a book announced by Strahan—“Henry Holbeach”—containing (I guess) a kind of Philosophy which would be in my way. I am better—indeed, feel quite myself, tho’ I am advised to work very little. The “Pastorals” have been ready some time, and I am finishing up the Poem of which I spoke in my last. In a week or so I will see & explain the whole thing fully. Meantime, the mere fact that I have another Poem ready is a secret shared between yourself and Lewes. Twill be published at first anonymously. Letter No. 1 in the collection. A word is crossed out before ‘letter by the way’. William Allingham replied to Buchanan’s review in The Athenæum of 18th February, 1865. Letter 11: 14th March 1865. Both these are mine, & will appear at a very short interval from each other—perhaps together; but the first edition of “Judas” will, I think, be anonymous. You’ll notice that I’ve withdrawn the Idyls from Smith & Elder. They were spoiling the book by repeated delays & publication in Cornhill; so I paid them back their money, & went over to Strahan—emphatically the rising light of the Paternoster firmament. It was my intention to dedicate my “Judas” to you, & the “Pastorals” to Lewes; but I shall now do neither. My testimony to your worth will come more strongly after I have gained the position wh: I believe these books will give me; and just now, the dedications—both yours & L’s—might be misconstrued. As I am not one of those who sing themselves hoarse at the outset, you will be more honoured by & by than now. In private & in public, I hold by one who held by me when I was down; and I can tell you, that leads me not seldom into warfare. Kind regards to Mrs Dixon. Letter No. 11 in the collection. A word is crossed out before ‘Iver’ in the address. This is the first mention of “Judas Iscariot: a Drama”, which is presumably a book-length verse drama along the lines of Buchanan’s later works, Napoleon Fallen and The Drama of Kings. In December 1865 he published ‘Verner Ravn: A Drama’ in the first edition of The Argosy, which perhaps offers some clue to the style of the longer work, but there’s nothing else to go on. Whether it followed the plot of his later poem, ‘The Ballad of Judas Iscariot’, or whether it was a more realistic or historical version of the story of Judas, is open to speculation, and nothing more. I have searched for the work, or extracts from the work, under Buchanan’s own name as well as his known pseudonyms, but all that came up was this quotation from “Judas Iscariot: a Drama”, which Buchanan used as the epigraph for Chapter 20 of The New Abelard. So, again, we can only speculate whether there are other remnants of Judas Iscariot: a Drama scattered throughout Buchanan’s works. Letter 12: 12th April 1865. I find that I shall not be able to see you before going to Hastings. I regret this, for I should enjoyed a chat amazingly. I wished to “see you” abt two things—my “Judas Iscariot” & the Athenaeum. There are several things in Judas abt wh: I would consult you; but I now think it will be better to send you the proof-sheets when the Book is fully printed. If you will kindly look these over, you will lay me under a great obligation—more especially as your recent tour in Syria may enable you to correct me by more than one local observation. In regard to the Athenaeum, I wished to see if there was any chance of your allowing me to select my own topics during the summer & writing special articles. The subjects I should choose wd: be out of the ‘ordinary’ range—e.g. the Old Ballads of Denmark, Oehlenschläger, &c. &c. Occasionally, too, I should like a new book. – I wished to explain in talk that there was no necessity for you to trouble yourself, as you have done, to give me work; but that there were subjects on wh: I like to write; above all, that my chief reason in broaching the matter was my wish to keep in friendly connexion with you, by proxy as it were, since our engagements permit us to meet so seldom. Letter No. 12 in the collection. Buchanan’s essay on ‘The Old Ballads of Denmark’ was published in August, but in The Fortnightly Review (edited by George Henry Lewes), not The Athenæum. Letter 13: 17th April . Many many thanks! I will send you the proofs of “Judas” as soon as they are sufficiently advanced. The Idyls should be out this week. Letter 14: 17th May 1865. I am very glad indeed to hear that you are pleased with “Inverburn.” The “Athenaeum” notice was somewhat curious; but it was evidently not written by you. Yes; this is a very delightful place, and thanks to its advantages I am rapidly picking up fibre. It will be a great pleasure to see you here. I see your “Holy Land” is out. If you have a copy to spare, & will send it to me, I shall be much obliged—& it will not be thrown away. Letter No. 13 in the collection. Letter 15: 8th July 1866. Herewith you have the first copy of “London Poems.” I am glad, very glad, the dedication pleased you. May the Contents do likewise! Letter No. 18 in the collection. The notepaper has a black border - Buchanan’s father died on 4th March, 1866 at Bexhill. Letter 16: 16th July 1866. I went off to Normandy abt a fortnight ago, leaving a postdated note to be posted to you by my wife on the arrival of the first copies of my book. Returning yesterday, I found that the first copies sent were unbound, but that she thought she might blunder if she omitted sending one on. Pardon us, therefore, for the blunder. The unbound copy will at any rate enable you to look at the work five days earlier than anybody else. Proper copies will of course be sent in the usual way, & a presentation one privately. Letter No. 14 in the collection. The notepaper has a black border. The date is a little obscure - the ‘1’ has been overwritten and could be mistaken for a ‘2’. However, if that was the case then Buchanan would surely have made some remark about the Athenæum review which was published on 21st July and was written by William Hepworth Dixon. A word is crossed out after ‘sending one’. Letter 17: 19th November 1866. Many welcomes back to England! I trust you bring both health, & wealth—of thought. But I shall say more soon. Meantime, I send you this reply to the “Saturday Reviewer”. Of course, it is merely correspondence, & affects you in no way; so that you wont grudge me the space for its insertion. The matter concerns me very materially, & this is only my first blow, tho’ it is my last in newspapers. I am armed to the teeth for a contest on this question. As for the Reviewer, he is my foe, & I have him by the throat. The letter is only abt 4 columns,—which is not much, seeing to how much discussion the first letter has given rise. – Will you sent me a proof? R. B. Letter No. 15 in the collection. ‘much’ is inserted above and between ‘how’ and ‘discussion’. ‘sent’ before ‘me a proof’ should obviously be ‘send’. Letter 18: 26th November . I would write more, but am unwell. Letter No. 19 in the collection. Which seems to imply that Buchanan sent a copy of his intended reply to the ‘Saturday Reviewer’, or at least told Browning what he was going to write, and received the same advice from Browning as he had from Dixon. Letter 19: 13th October 1867. Your two letters have just reached me here, & the books await me at Oban. – I had better not attempt the Percy paper at this distance, more especially as I am not very occult in that affair. But many thanks for the offer. I have far more to thank you for that intercession wh: doubtless procured for my cousin the secretaryship to young Dilke. Of course I have been shaken again—this time my head being very bad. The hills are doing me good, praise God! You will soon see my two books—the volume of essays & the volume of poems. They should be nearly ready now. The latter contains my best & maturest work, & the former is a comment & a declaration. Letter No. 16 in the collection. The ‘Percy paper’ presumably refers to Bishop Percy’s Folio Manuscript: Ballads and Romances edited by John W. Hales, M.A. and Frederick J. Furnivall, M.A. (London N. Trübner & Co., 1867) which was reviewed in The Athenæum by Rev. Walter William Skeat in the edition of 27th June, 1868. In this context I think ‘occult’ means ‘hidden’ and perhaps refers back to Buchanan’s criticism of Allingham’s Ballads book in which he praised Percy. The 1861 census return for Robert Buchanan Snr. includes a ‘William Williams’, nephew of Buchanan Snr. and thus a cousin of Robert Buchanan Jnr. Since I’ve not come across any other relatives, I’m assuming that this is the one referred to in this letter. In the census his age is given as 15, so he’d be around 21 at this time. ‘Young Dilke’, I am just guessing, is Sir Charles Dilke, who became a Liberal M.P. in 1868. Letter 20: no date [January or February 1868]. I enclose you a first copy of the essays, which will be out to the press abt Monday or Tuesday. I regard it as very important that this book should find its public, & I hope that it will awaken your interest & sympathy. If you dont review it yourself, I hope you will give it to some earnest man, capable of grasping its significance as a complete (tho’ concentrated) “confession of faith.” Apart from pure literary confession & reflection, let me ask you to read (& correct) the passages marked on p. 180 – 197 – 277 – 281 – 315. But the book is meant to be whole & thorough, & as wide in application as possible. I ask nothing, of course, but an early record—if with “brains” in it, all the better. N. B. Ive written asking to “do” Spiritual Wives for a good quarter,—two indeed. You may look out for the heavy physiological from Dr Chapman in the “Westminster.” For my part, the theocratic & physiological seem so intermixed & confused,—that I would as soon explain thought by wine as spiritual fornication by cerebellic action alone. It is an awful question, referable to no known law with total certainty. Letter No. 22 in the collection. ‘poetic’ is crossed out before ‘confession & reflection’ and ‘literary’ written above. ‘or’ before ‘stranger episode’ could be ‘&’ (difficult to tell which is the correction). Buchanan’s David Gray and other Essays, chiefly on poetry was reviewed by John Westland Marston in The Athenæum on 15th February, 1868. William Hepworth Dixon’s book, Spiritual Wives, was published in January, 1868. Chapter 8 concerns itself with the Mormon church and polygamy which, one could speculate, was at least one of the sources for St. Abe and his Seven Wives. Letter 21: 21st March 1868. I suppose Black’s story is put in other hands. – Will you let me have Nettleship’s “Essays on Robert Browning’s Poetry,”—wh: will afford a pretty good opportunity of a fairly exhaustive survey of B’s wondrous genius? There is also a little book appearing on Tennyson;—& the two might be pieced together in one review. Of course I love B. best, but I should be fair to the other. I want, too, the Rev. Mr Barnes “Rural Poems in Common English” & (if you dont mind a strong condemnatory paper) Arnold’s new Essays on Education. After A’s sneer at yourself you can have no pity; and further, I doubt whether you are right to trust so implicitly to special-subject men. De Morgan’s opening review this week is unworthy of a leading journal, & ’tis pitiable so wild a thinker & writer should have free scope. You know I admire De Morgan for his true qualities; so you’ll pardon my candour. Letter No. 17 in the collection. ‘Black’s story’ is presumably Love or Marriage? by William Black, which was reviewed by Sir Robert Romer in The Athenæum of 11th April, 1868. Black had lived with the Buchanans when he first moved to London from Glasgow in 1863, but for some unknown reason the friendship did not last. Buchanan’s review Essays on Robert Browning’s Poetry by John T. Nettleship and A Study of the Works of Alfred Tennyson, D.C.L., Poet-Laureate by Edward Campbell Tainsh appeared in The Athenæum of 27th June, 1868. Poems of Rural Life in Common English By William Barnes was reviewed by John Westland Marston in The Athenæum of 11th April, 1868. The Matthew Arnold essay is presumably Schools and Universities on the Continent which was reviewed by Edward Wilberforce in The Athenæum of 4th April, 1868. I’ve not traced the ‘sneer’ referred to in the letter but Arnold did refer to Dixon’s Spiritual Wives in Culture and Anarchy, published the following year, so perhaps the ‘sneer’ was related to Dixon’s book (Culture and Anarchy - pp. 114-117, 223,225). Letter 22: 15th February . I shall make one article of Story & Noel—more or less complimentary to both;—one book curiously illustrates the other, tho’ they are strong in contrast. I am busy on the article now, & it will not be delayed beyond this week. If I have been a little remiss lately, think of my anxieties, & forgive me—as I would forgive much worse in you—very much more. I should have much valued a kindly word from you abt my Readings, as they are of great practical importance to me & mine,—but I do not wish to obtrude them upon you. I feel a great delicacy in these things, when I fancy a friend is uninterested or preoccupied; but “delicacy” does mean “pain,” & I am perhaps wrong to feel it from so good a friend as you. You will serve my next Reading very much by inserting enclosed par. in this week’s “Gossip.” I hope you wont cut out the programme of pieces to be read, as it is very important. Letter No. 21 in the collection. ‘I hope’ originally ‘I hoped’ - the ‘d’ is crossed out. The paragraph for inclusion in The Athenæum shows signs of much correction. After ‘March 3’ ‘rd’ is crossed out. A capital P is overwritten and underlined in ‘Programme’. ‘of’ is written above and between ‘consists’ and ‘Marc Antony’. The titles of the poems are in inverted commas which have then been crossed out up to the one following ‘Drumliemoor’. Buchanan’s review of Graffiti d’Italia by W. W. Story and Beatrice, and other Poems by the Hon. 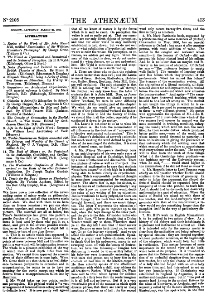 Roden Noel appeared in The Athenæum of 13th March, 1869. Buchanan’s first London Reading took place at the Hanover Square Rooms on 25th January 1869. His second Reading occurred on 3rd March. This was a very difficult time for Buchanan, who had hoped his Poetry Reading scheme would raise some much-needed funds. Instead, on his return to London from his home in Scotland, he was beset by a number of creditors.